Opening batsman Alex Hales will miss the remainder of England’s tour of India after scans revealed that he fractured his right hand during the second one-day international against India on Thursday in Cuttack. England opener Alex Hales will be missing the remainder of the India tour as he is returning home following an injury in his right hand during the second one-day international. Hales fractured his right hand whilst attempting a catch during the second one-dayer on Thursday which England lost by 15 runs at the Barabati Stadium. 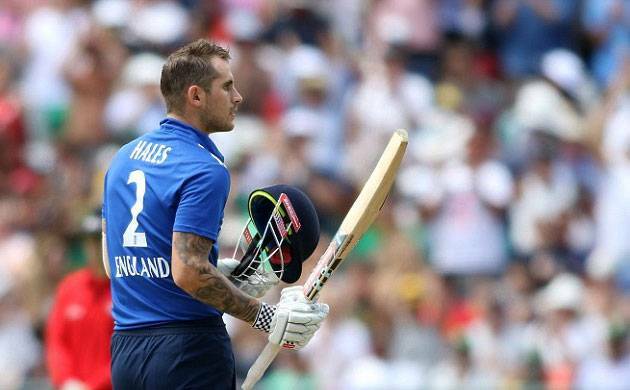 “Opening batsman Alex Hales will miss the remainder of England’s tour of India after scans revealed that he fractured his right hand during the second one-day international against India on Thursday in Cuttack,” an ECB release said. Hales had suffered the injury while attempting a catch in the outfield when he jarred his hand on the ground. The 28-year-old will return to England tomorrow and will see a hand surgeon next week. England will announce Hales’s replacement in the Twenty20 international squad for the three-match series against India, starting on 26 January, in due course. The visiting team will play the third ODI against India on Jan 22 at Kolkata.